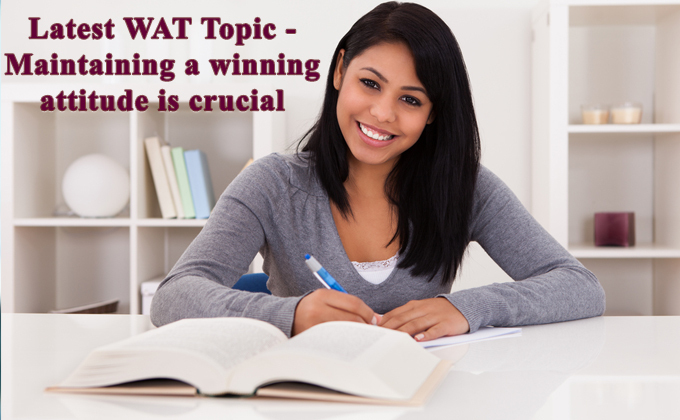 WAT or Written ability Test has also become a tool to test MBA aspirant on assessing overall communication and personality so it is also equally important and crucial component of MBA selection process. Walt Disney once said that ‘if you can dream it, you can do it’. When no one believed in Disney’s idea of a theme park, he did not give up. He was determined to make his dream a reality. Today, there is nobody in the world who is not familiar with Disney. This is the power of determination and the power of having and maintaining a winning attitude. You need to have a winning attitude to be successful in life. Success is not in the surroundings, but in you. Having a winning attitude means that you enter a place or start a task, with the goal of winning. When you are determined to take the 1st prize, you will channelize your energy into honing your skills that you will enable you to reach the top. Can cynicism & Optimism coexist? Cynicism and optimism seem to be opposite sides of the same coin, inclusion of one necessarily seems to exclude the other. Without a winning attitude, there is no determination to succeed. It is like living a meaningless life. Maintaining a winning attitude is not just limited to competitions and examinations. A winning attitude has to be present every day, in your career, at home and with your family. There is a saying that ‘attitude is everything’. Maintaining a positive attitude in life is a prerequisite for both personal and professional success. Did you know that the key difference between successful and unsuccessful people is in the way they think? Successful people enter a situation with optimism, ready to face any challenge they may encounter. On the other hand, unsuccessful people enter a situation with pessimism, uncertain about their capabilities and their chances of winning. It is this uncertainty that drowns an individual and does not allow him to move forward in life despite difficulties. A winning attitude not only gives you power and strength to face challenges, it keeps your mind focused on the goal. A winning attitude takes time to nurture and develop. However, the benefits of having a winning attitude are countless. Once you develop this attitude, you will enjoy the fruits of your labor and success. In addition, by having a positive attitude, you will spread positive vibes around you and fill the lives of the people around you with optimism.